Gen Xtinct: "Back to the Future"
So, apparently time travel is real. Feels like it, anyway -- no amount of Flux Capacitor-fueled DeLoreans could make time zip by the way the last 25 years have. Case in point: Marty McFly first went “Back to the Future” a quarter-century ago (! 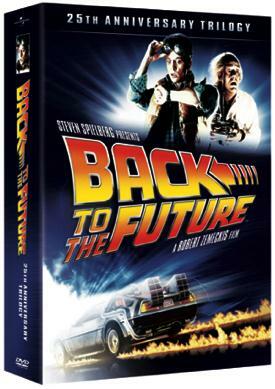 ), and to celebrate, the whole trilogy is being released on DVD and, for the first time, Blu-ray. Much of the cast appeared on the Today Show on Tuesday, including Michael J. Fox, Christopher Lloyd, Lea Thompson, Mary Steenburgen and director Robert Zemeckis. Plus Huey Lewis! Wasn’t it just yesterday we were settling in with a bucket of popcorn and a Pepsi Free and watching Crispin Glover tell Caroline in the City that he was her density, marveling at Doc’s crazy hair, or wondering how Marty’s girlfriend Jennifer mysteriously transformed into Elisabeth Shue between the first and second movies? So, just how accurate were “Back to the Future’s” future-world predictions? Check out this awesome tally from Gawker.com of 11 things that actually came true, and three that haven’t yet. And here's the original movie trailer. McFly! Actually, Back to the Future was released in July 1985. Not October. July 3, to be exact. You're right, Paxton. The movie did indeed come out on July 3. Oct. 26, 1985 was the date Marty went all time-travely in the flick. I updated the entry to reflect that info. Thanks!